Yesterday, 21st April 2018, I took my parents to visit Canterbury for a day out. On the return, as it was a beautiful and unseasonably warm day for April, we stopped off at Detling Hill so I could do a quick SOTA activation. Detling Hill itself is a lovely place but boring from a SOTA point-of-view. It’s a one-point summit just off the A249. which links the M20 and M2 motorways on the outskirts of Maidstone, Kent. The easiest way to activate the summit is to park at the White Wood Country Park, where there is masses of parking for just £1.50 per day at weekends. The car park is in the activation zone and there are park benches there – perfect for operating! Since this felt rather like cheating, however, I did at least do the short walk to the trig point after completing the 4 QSOs. The trig point is maybe 5 minutes’ walk along a surfaced path from the car park, with very little incline. To make my activation a little more interesting, I was aware that my time on the hill coincided with the first few minutes of the first ever RSGB MGM (Machine-Generated Modes) contest, taking place on 2m and 6m. 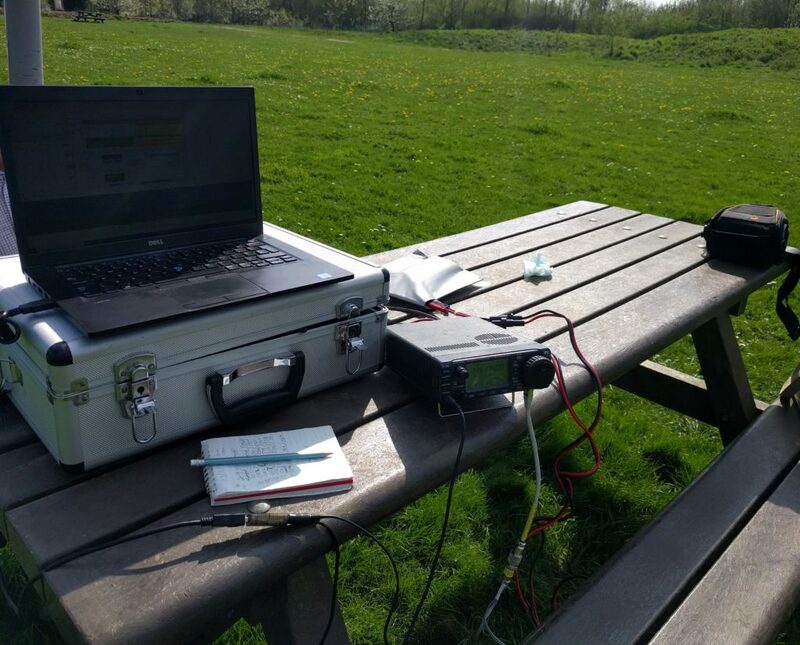 With the knowledge that there would be a bench to operate from and masses of space, I took the opportunity to use my 3 element 2m beam that I bought in Rosmalen a few weeks ago and make my 4 QSOs using the FT8 mode. This was successful in that I made the requisite number of contacts, but I was aware that something was wrong with my portable setup – I was apparently not hearing many of those calling me, and I also couldn’t see anything on my ALC meter. Something to investigate, as it had been working OK at home.